THE NEW SONY ALPHA SLT-A99 DSLR: THE BATTLE LINES ARE DRAWN! The main point of a recent (August 2012) PhotographyTalk article was that the rumored Sony Alpha SLT-A99 DSLR would likely be very competitive with Nikon and Canon full-frame cameras in the same category. That article was based on broad speculation, but now this new Sony full-frame DSLR has been officially introduced (as of September 11, 2012), revealing how well it is equipped for the full-frame battlefield. With Photokina 2012 to open its doors a few days (September 18) after this article appears in PhotographyTalk’s Equipment Review section, the Sony a99 DSLR will undoubtedly attract considerable interest. As the company’s replacement for the venerable A900 and A850 bodies, serious enthusiasts and professionals are sure to be curious about what Sony has designed into this camera to face the current and future challenges from Nikon and Canon. Sony’s Translucent Mirror Technology™is one of the major differences of how it approaches DSLR photography. Canon and Nikon has retained the reflex mirror mechanism that was also central to its traditional film cameras. Instead of a mirror flipping from the path of light during each exposure, which causes a mechanical delay, Sony’s DSLRs use a fixed-position, translucent mirror, which sends a steady stream of light onto both the camera’s imaging sensor and phase-detection auto-focus sensor. This results in faster AF when using any Sony or Minolta A-mount lenses. Plus, the AF maintains that speed in burst and movie modes. In the new full-frame a99, this translates to a speedy 12fps continuous shooting mode. Although sensor size does not dominate a digital camera’s specifications as it did during the past, Sony knew the a99 wouldn’t attract serious amateurs or working professionals without a sensor equal to their needs. Sensor technology has come a long way since the introduction of the older Sony a850 and a900, so even the constituent components, such as the silicon, is of a higher quality in the a99’s 24.3-MP sensor. Designed and manufactured by Sony, this “Exmor” CMOS sensor reportedly has twice the sensitivity for excellent low-light capture as all previous Sony full-frame DSLRs and significant dynamic-range improvement. This is supported with an ISO range expandable to 100–25,600. The quality of a full-frame sensor is also measured by the capabilities of its companion image processor. 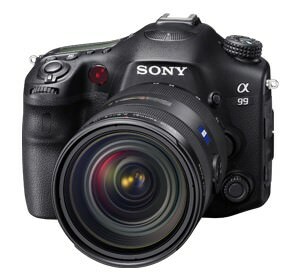 Sony has also given the a99 a new Bionz image engine that provides for another first in Sony DSLRs: 14-bit RAW images. Serious photographers and professionals should be impressed by the processor’s offloading-image rate of 6fps, or 10fps in high-speed mode. Certain to be of equal importance to pros is the a99’s noise-reduction capability. It pinpoints specific areas with intelligent algorithms to correct noise level and type in texture, continuous color and edges. Sony seems to be convinced this will carry great weight when photographers compare the a99 to its Canon and Nikon counterparts. The a99’s dual autofocus system is the clearest evidence that Sony is as serious as a broken arm. The whiz-bang spec is 102 AF points, but one must peer deeper into the a99’s AF to understand thoroughly what Sony has achieved. The first of the phase-detection sensors is quite traditional, with 19 points, 11 of which are the cross-type. The 102 points are found on the second, or a focal-plane, phase-detection AF that is an add-on component of the imaging sensor. The wonder of this dual AF system doesn’t stop there; it also includes two new modes, AF-D and AF Range Control. Upon selecting the AF-D mode, the 19 points of the first phase-detection sensor and the 102 points of the second are put to work together. They analyze your composition, so the camera is capable of perceiving the subject, or foreground, from the background very distinctly. Sports, action and wildlife photographers (especially those framing bird subjects) will find that the AF-D mode is the perfect creative tool for them. The details of the AF Range Mode may be more wondrous yet. Imagine controlling the AF so precisely that it is capable of operating within a specific distance range, intelligently disregarding any focus information in front of or behind that range. You’d be able to choose a narrow focus range, such as .5 to 1.0 feet, which is where the subject is positioned and easily set and maintain focus because the camera would ignore whatever else may be in the frame. The AF Range Mode on the new Sony a99 does exactly that…and displays the subject’s distance onscreen and whether it appears within the range you’ve selected. As Sony’s top-of-the-line, full-frame DSLR, the a99 includes the company’s signature EVF XGA OLED Tru-Finder Viewfinder, with 2,359,000-dot resolution and a 100% field of view. Again, the pros should like the finer points, such as a view of the depth of field, exposure setting outcomes and color tone adjustment, which Sony is offering for the first time in any of its DSLRs. The 3-inch, 1,228,800-dot LCD display also includes tilt and rotation capabilities: A 140-degree upward and 180-degree downward tilt and a rotation angle of 180 degrees clockwise and 90 degrees counterclockwise. Control brightness in auto and manual modes with 5 steps from -2 to +2 and customize the display for a variety of data, such as shooting info and Histogram. Serious photographers and professionals are probably less concerned about the beauty of a full-frame DSLR and more interested in how much wear and tear it can take. The Sony a99 appears to be constructed for a long, productive life with a magnesium-alloy body and dust and moisture seals. The people at Sony were able to make the a99 the lightest of its competitors at just 1 lb. 9.9 oz. (733g), body only. Of course, it’s the SLT technology that contributes significantly to the camera’s lighter weight, since fewer parts are needed than the mirror technology in single-lens reflex models. Pros are sure to appreciate the a99’s Quick Navi Pro feature. A function button and the camera’s dials work together, so settings are easier to change. The body was also designed to accommodate dual card slots: one SD and the other will accept either MS or SD. Sony then gave the slots the versatility that serious amateurs and pros demand. Record images initially on one and then use the other for backup. Reserve one for still images and the other for video segments. You’ll also be able to copy folders from one media to another. The Sony a99 enters the competitive, full-frame DSLR battlefield with a significant change in the wind. The pros have essentially shunned the video capabilities in their high-end DSLRs, especially if purchased a few years ago. Now, however, we can trot forward the old cliché and say there seems to be a “new breed” of multi-media visual professionals, who understand how valuable it is to be able to shoot stills and the highest quality video with the same camera…and how well they sell in the photography marketplace. Sony understands this trend and the growing market for video technology that decentralizes the artistic and commercial community, putting more creativity in the hands of those who have a story to tell, but no big studio or budget behind them to create it. Clearly, Sony added just about every appropriate video capability into the a99 DSLR. With 1080/60p Full-HD, this camera already surpasses many of its competitors, but then add fulltime, continuous AF and this becomes a serious video tool. The AF in other full-frame cameras tends to jerk and hesitate as it tries to seek and lock onto a moving subject. The Sony’s advantage is that it doesn’t use contrast detection, so the focus is very smooth and finds and subject-locks with great speed. 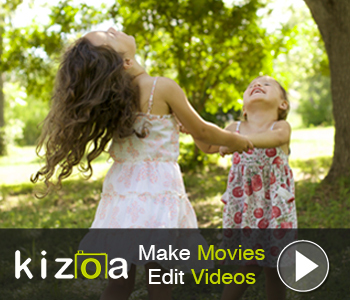 Pro videographers will also find full manual and P, S and A movie modes. As if that wasn’t enough, Sony has also given the a99 what the company calls a “Silent Multi-Controller.” This programmable function makes it possible to control the camera (during video recording) with a dial and button, instead of the clicking noise heard on other cameras. Another video goodie is recording clean, uncompressed HDMI to a separate recorder. Video creativity isn’t possible with an equal improvement in audio functionality; and, since Sony knows more than most about audio technology, it has packed the a99 DSLR with many capabilities. 32-step audio input level displayed as camera data. Headphone jack with 20-step output, matches audio level of the video playback. Compatible with optional Sony XLR Adapter and Microphone Kit. Like some video-game warrior, the new Sony Alpha SLT-a99 DSLR appears to be fully armed and girded for the fight, but the real battle takes place in the marketplace where, also like a video game, consumers choose their champions. There’s no doubt the full-frame a99 deserves equal consideration by any serious amateur or professionals, who is prepared to pay approximately $2,800 for this camera. The true test is whether Sony can steal long-time Canon and Nikon loyalists, especially from the ranks of the pros, as well as steer first-time, high-end DSLR buyers toward what the a99 promises to become. Stay tuned; we’re only entering the first round.